A striking building stands behind a row of young gingko trees in the northwest corner of the University of B.C. campus. Five silver, arced roofs rise along its length, giving the impression of a ship’s sails billowing towards the North Shore mountains. The unusual, purplish colour of the brick cladding contrasts with the 100-foot coniferous forest looming behind. This is the C.K. Choi building, a structure thoroughly planned to reduce ill effects on its surroundings, one of the most advanced in use in B.C. Completed early this year, it functions as a normal component of the campus, containing the Institute of Asian Research. It’s an embodiment of new standards for sustainable design, construction and operations, goals set at a pre-design meeting by university planning representatives, its future users and assorted consultants. Its novel environmental features have drawn calls and visitors from around the world. So far, its innovations have been recognized with the B.C. 196 Earth Award, presented by the Building Owners and Managers Association. As the piece de resistance among the few local environmentally sound structures, the Choi building is notable for having made it off the drafting table and onto a piece of property. While Vancouver has a relatively large contingent of professionals working in the field of environmental design, the difficulty of convincing people who influence building decisions to “go green,” the few financial incentives, and the lack of political will, remain a formidable, if passive, opposition. Matsuzaki Wright Architects, the firm that designed the institute, gave environmental attention to every possible aspect of the building. From the high percentage of recycled materials used in construction to the natural ventilation, the designers rejected industry standards and came up with site-specific solutions. Four categories make up the environmental targets: reducing consumption and environmental impact; minimizing the energy and pollution needed to produce building materials; lowering operating energy needs; and creating a livable work space. Fitting into the first category, the Choi building’s flushless, composting toilets provoke more curiosity than any other feature. Completely disconnected from the sewer system, what goes in ends up as fertilizer for the surrounding plants. The process from point A to point B involves a system of five trays at the bottom of the toilets’ 14-inch stainless steel chutes. Maintenance staff throw in wood chips to aid the composting process, and red wiggler worms burrow through the muck to turn human digestive by-products into topsoil. The liquids, called composting tea, join the building’s used water in a sub-surface “greywater trench” that runs along the side of the building, where it is naturally cleaned by micro-organisms on plant roots before being stored for summer irrigation. The system saves more than 1,500 gallons of water a day, as well as eliminating a potential load on the sanitary system by the same amount. The building’s two distinctive visual features fall under the second category, carrying on local history in a new location. The exterior bricks used to be downtown pavement at the turn of the century, and the visible, heavy timber structural beams come from the former Armouries, a 1930s campus structure familiar to recent generations of students where they wrote final exams. Other items like railings, bathroom fixtures, doors and door frames were salvaged from torn-down buildings. The builders aimed to use 50 per cent recycled material, but the actual amount is impossible to gauge without an in-depth research project, said Perdue. Building components such as steel, insulation, and even the polished concrete floors contain recycled material, but the ingredient percentages vary. On the energy-reduction front, the Choi building maximizes daylight use and natural ventilation. Work stations are located beside large windows that let in plenty of light — a situation made easier by the building’s narrowness–even on overcast days. A control system dims electric lights if adequate natural light is available, or turns them off if a room is vacant. The building uses less than half the amount of lighting required for typical office buildings. The five atria topped by curved roofs that rise up beyond the three-storey height have north-facing windows–natural light wells that help illuminated second- and third-floor areas, and facilitate ventilation. Air drawn into the building through vents under each window warms and rises to the top of each atrium, where louvres open to release air once it reaches a certain temperature. The relative openness of the building allows air to circulated freely, aided by a few fans. The most sustainable aspect of the building, however, had to be that people would enjoy working in it. To achieve that, the designers aimed to control the interior finishing as rigorously as they did the air and light requirements. Materials were chosen for their lack of “off-gassing,” or chemical emissions. No adhesives were used to lay natural-fibre carpets, the paint is acrylic, and photocopy machine areas were designed with extra venting to combat toner chemicals. The achievements of the Choi building can easily be considered desirable in a time of growing public environmental awareness, and the focus on creating a healthy workplace a welcome response to “sick” buildings. Yet the experience of the people trying to widen environmental boundaries shows the path is anything but straightforward. She described the lack of understanding among some of the people peripheral to the project. A plumbing inspector not originally from Canada questioned the wisdom of installing composting toilets. “Why do you want to go backwards?” she recalls the man, who grew up in a country without sewage infrastructure, asking. While some architectural firms like Matsuzaki Wright might be environmentally forward-thinking, people who commission building designs don’t necessarily have such inclinations. In the case of the Choi project, that problem didn’t exist. 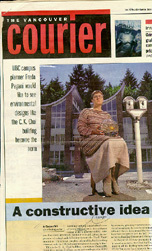 Freda Pagani, UBC campus planning and development’s associate project development director, is a driving force behind the environmental consciousness of the new buildings being constructed there. She and her co-workers are the reason that a benchmark project such as the Choi building was considered for the site. Getting approval for new technologies and determining the safety of second-hand materials topped the list of hurdles. Health officials, for instance, took a thorough look at the composting toilets before giving a go-ahead, and still required a sewer connection to be laid in case it needs to be hooked up in the future. Confirming the safety of recycled materials was also a stumbling block, because the amount of money saved by using them shrinks with the coast of research and inspection. Perdue gave working examples of this situation. In the long search for appropriate cladding bricks, she contacted demolition companies and learned about the variety of brick quality present in old buildings. Former street pavers worked out best. The ungraded wooden beams from the old Armoury presented another problem. Initially, the grader said that 80 per cent of the wood wasn’t usable, but later all but a small percentage was deemed structurally sound. The wood had checks, or cracks, and the grader hadn’t been convinced that these didn’t affect the beams’ integrity, given that new wood doesn’t have them. The perception of increased cost was another aspect of environmental construction that Pagani had to address. The Choi building was built with the same fixed, dollars-per-square-foot budget as any other campus building. Some materials were more expensive while others were cheaper, and the overall technological expense was lower because there was no need for an air-duct system for ventilation. Savings due to energy-efficient design also come into play in the long run, she said. Perdue is adamant that not having money to spend on expensive materials like granite flooring doesn’t mean that a building is not attractive. With its openness, white reflective surfaces and exposed timber beams, the Choi building has the airy, modern feel of a remodelled warehouse. Extra time spent on research was controversial, Perdue added, because the expense fell to the architects. Since the building was destined to be a model of possibilities, she and co-workers felt the pressure to be perfect. Describing it as a labour of love, she said Matsuzaki Wright took on the project because the firm believes in the goals it set. Citing a United Nations scientific study that confirms climactic changes have occurred through human intervention, Pagani believes the world’s environmental situation is critical. Nevertheless, she doesn’t support the idea of legislation to change the war people build. Rules are restrictive and don’t foster innovation, which she says is exactly what is needed. The Choi project is a perfect example, having been set in motion by her and others’ personal engagement. She acknowledged that governments are uninspiring and provide few incentives for developers to turn to environmental construction.